On behalf of the Scientific Committee of IMCAS Americas 2019 , we invite you to submit an abstract. Thank you for your interest in IMCAS Americas 2019 . Abstract submission deadline: Monday 1 July 2019 23:59 (Paris - France time). Abstracts received after this date will not be considered. Once you have completed your abstract submission, you can check its status at any time by logging onto your account. You will receive a definitive answer regarding the inclusion of your lecture in the conference within 30 days following submission. If your abstract is chosen, you will receive the necessary payment and disclosure instructions. Please note that your presence during the conference is mandatory, otherwise your presentation will be withdrawn. 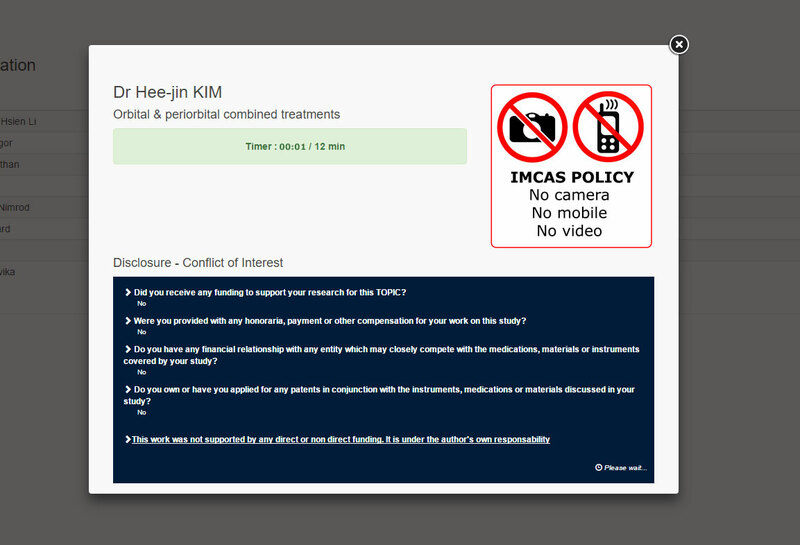 Please carefully read the Guidelines and Conflict of Interest Policy before any submission. LIVE LEARNING activity - lectures taking place on-site in front of a LIVE audience. ONLINE LEARNING activity - lectures broadcasted on our e-learning platform for an ONLINE audience. Abstracts can only be submitted electronically through our website and will be reviewed by the Scientific Board. Abstracts must be written in English and presentations will be in English. Abstracts will be reproduced as submitted by the author. Content may be rejected if it does not feature actual data or is poorly drafted. The submitting author must ensure that his/her biostatement is filled in. Only previously unpublished abstracts will be considered for presentation, that is to say not published elsewhere nor submitted for presentation at another national meeting within the 6 previous or 6 following months. By submitting an abstract, the author agrees to fully disclose any conflict of interest. Failure to disclose commercial support may lead to a rejection of the submitted abstract. A session within a conference room. An "open stage" session. Your presentation is held within the exhibition area and the recording is at your disposal for personal use following the congress. A "web" session. 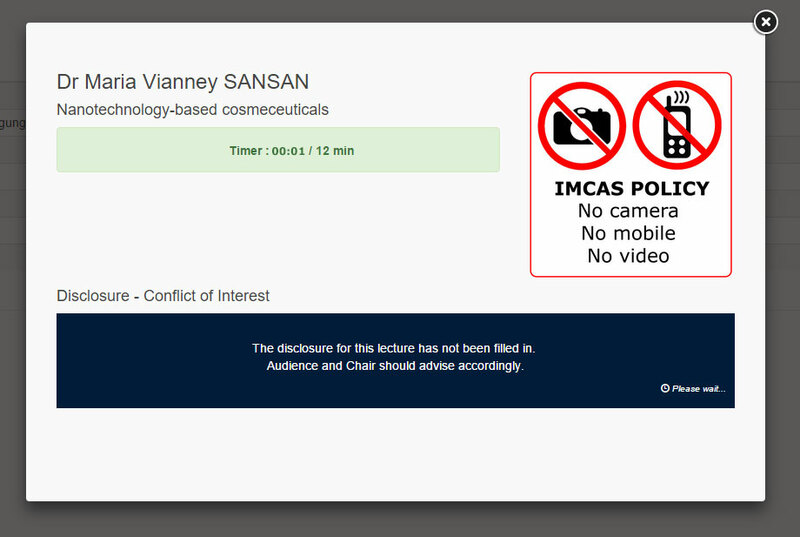 Your presentation is filmed in a closed studio space with no physical audience aimed for e-learning purposes on IMCAS Academy. 6 to 15 minutes duration, depending on the session. The exact duration will be visible on your speaker account once your abstract has been accepted. PPT or keynote slide presentation which may include video(s). Electronic version of a traditional poster board, presenting scientific information via pictures, graphs and tables with an attractive visual layout. Poster boards displaying scientific research via pictures, graphs and tables with an attractive visual layout. The main author should be a physician. Both the lecture title and the abstract must remain strictly unbiased and cannot contain any product/device/company name nor any brand name(s). Please use generic terms or pharmacopeia names and describe the technical characteristics of the product/device only. Should you require to make a comparative study, brand can be stated only if they are stated in comparison with other brand names. Studies must be from a scientific and technical perspective, not a marketing one. The display of industry logos is forbidden. This presentation is placed in a session identified as sponsored. Thus the content is under the complete responsibility of the sponsoring company. Authors must fully declare the Conflict of Interest Disclosure. The main author should be a physician and/or an engineer. Lectures must deal with an innovation. The product/ device must still be in development research phase and not yet commercialized. The abstract content has to deal with an innovative product or device commercialized on the market for less than 18 months. The new tech lectures are placed in a dedicated “new tech” session which fall under an education grant support. Thus the content, although controlled by the scientific committee, is under the esponsibility of the granting company. IMCAS constantly insists on complete independence between instructional (or scientific) courses and the industry sponsors of its congresses. Scientific lectures are presumed to be based on objective interpretations of evidence and unbiased interpretations of facts with a fair representation of all specialities concerned in the field of aesthetics whether medical aesthetics, with plastic surgery and dermatology, or non medical aesthetics with the new development of the cosmeceutic field. The integrity of our conference requires disclosure of the possibilities of potentially distorting influences.The audience may then judge and, if necessary, make allowance for the impact of the bias on the information being reported. Consequently, all faculty members must openly disclose any COI that can influence the content of their presentation. A situation in which a person (or spouse or partner) who is lecturing at IMCAS has a sufficient personal and/or financial relationship with a commercial or non-commercial entity that may thus bias the content of his/her presentation. The appropriate and most open course of action is to disclose activities and relationships that, if known to others, might be viewed as a conflict of interest, even if speakers do not believe that any conflict or bias exists. Bias is a term used to describe a tendency or preference towards a particular perspective, ideology or result, especially when the tendency interferes with the ability to be impartial, unprejudiced or objective. Bias may be scientific, political, religious, gender-related, ethnic, racial, cultural or geographical. Bias may occur in relation to a particular industry or commercial product such as a mechanical device or pharmaceutical agent, or in relation to a particular intellectual, political or other view, in situations where a range of products or views may be equally useful or valid. What about the level of "significance" in terms of interest? Whether an interest is “significant” will depend on individual circumstances and cannot be defined by a dollar amount. Participation on a board of directors or any other relationship with a product, device or company should be carefully considered for possible disclosure. In addition speakers should also carefully consider disclosure where circumstances could suggest bias against or towards a product, device or company. How about speaker(s) declaring a "no Conflict of Interest"? Neither the speaker nor any member of his/her immediate family has a significant financial arrangement or affiliation with the product, device or company involved in the congress nor any potential bias against or towards another product, device or company. 3. How to submit your COI?